Dr. Michelle Crews believes in using her expertise in dentistry to offer patients world-class care while also giving back to the community. She is a member of the American Dental Association, the Mississippi Dental Association, the International Congress of Oral Implantology, American Academy of Dental Sleep Medicine, and the Mississippi Association of Women Dentists. She was recently awarded Fellowship in the International College of Dentists. In her free time, Dr. Crews actively volunteers with multiple charities. She has provided dental services through the All God’s Children Mississippi ministry, which sponsors children in need from Belarus with dental care that is not readily available to them. Dr. Crews also volunteers with Donated Dental Services and Caring Hands Clinic. Uptown Dental’s new location in The Township at Colony Park is custom-designed to offer the very best care available in the area. 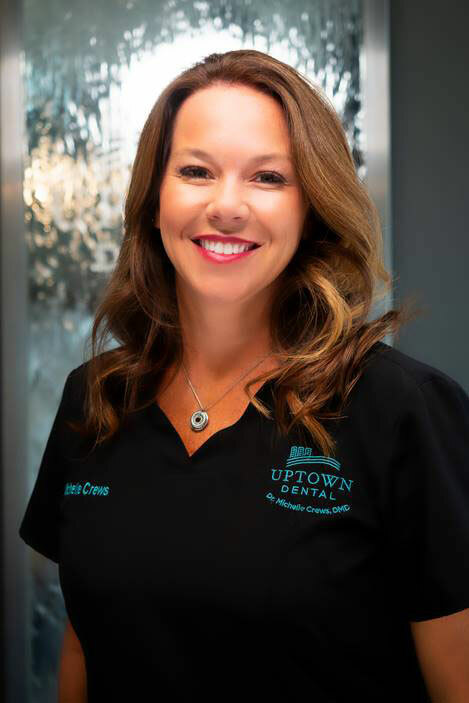 Dr. Crews offers services such as Kor teeth whitening, porcelain veneers, Invisalign, Lumineers, dental implants, sedation dentistry, and minimally invasive laser dentistry. She also provides state-of-the-art 3D Cone Beam Imaging for precise guided implant surgery as well as comprehensive diagnosis. A graduate of the University of Mississippi School of Dentistry in Jackson, Mississippi, Dr. Crews has also completed extensive training at the Misch International Implant Institute in the placement and restoration of dental implants. In addition, she was awarded fellowship in the International Congress of Oral Implantology and the Misch International Implant Institute.